Unfortunately, your budget is not sufficiently robust to select all three, so you need to evaluate what to buy. Further complicating the problem is that police and security want the camera system, facilities is supporting the access control system and IT advocates the panic buttons. Each attendee can make a convincing argument in support of his or her desired option. Often, in the byzantine world of procurement, all things being equal, the decision will reflect the personalities of the respective policy options, their alliances and their political and negotiation skills. As a result, the decision made may reflect the desires of the most capable and powerful advocate; not necessarily what’s demonstrably best for the school. 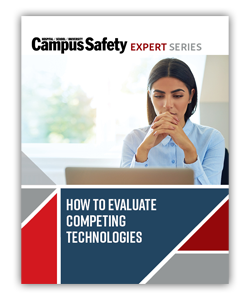 This free whitepaper “How to Evaluate Competing Technology” provides an empirically verifiable evaluative framework to choose between equally attractive yet competing technologies. It also can be useful to vendors to suggest how to present their wares to make them most attractive to potential customers.